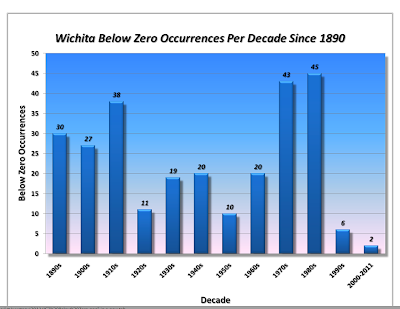 Wichita, after five years, got below zero this week. All the way to -1°F. This is only the second time since 2000. The graphic below shows the trend of less extreme cold in recent years. Not only are there fewer days with extreme cold, we have fewer days with temperatures 100° or higher. Hmmm, less extreme cold...less extreme heat...more and more dependable rain in the last twenty years? If this is "climate change" may we have more, please? cooler summers, not as cold winters. Thanks, Richard. Keep up the good work.